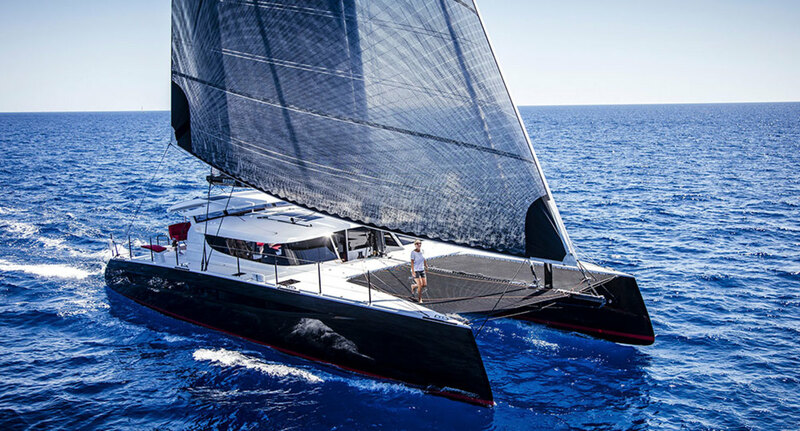 High-performance sailing with luxury living set atop a carbon fiber platform – that pretty well describes the newly launched HH66 performance cruising catamaran. This Morrelli and Melvin design is built in Xiamen, China and soon will be joined by other models ranging from 55-88 feet. Since there is a bit of a vacuum now in this range of all-carbon production cats, this new range is likely to get some attention. The builder is Hudson Marine, owned by Hudson Wang who employs over 4,000 people in his various other manufacturing businesses that produce everything from baseball bats to airliner emergency slides. About 10% of the workforce is focused on the budding boatbuilding business. There are two configurations available on deck: an elevated center helm station or twin wheels outboard on either side. The first 66 has the latter, which to me, not only looks better, it seems more functional as well so you can see the headsails when under way or the dock when coming along side. R-Six is a carbon construction with a clear coat finish and it’s an impressive looking machine. Reverse bows with extremely fine entries, a relatively low and sleek coach house and a carbon mast and V-boom give her an almost predatory appearance. The HH66 comes in at 37,000 pounds dry and draws six feet with her dagger boards down. She is equipped with a 125% solent rig and has been clocked sailing in the mid-twenty knot range. Hudson Marine is fond of calling these new multihulls, “supercats”. I’m not sure what that means but they certainly are big, amenity-laden, seemingly fast, and able to put in 350-nautical mile days in the right conditions. The first one is cruising the Med and the next one will have its U.S. debut in Miami in February, 2017.